Mashable‘s Co-Editor Ben Parr discussed his predictions for the Web of the future in his weekly column, The Social Analyst. Did you know that it’s been nearly twenty years since the first website was placed online? Have you ever thought about how the Internet and the web have evolved in time? As we approach the imminent launch of the Apple Tablet and analyze new trends coming out of out of this year’s Consumer Electronics Show (our full coverage), now is good time to reflect on what the web will look like in the next decade — and beyond. Our society couldn’t operate today without Wi-Fi, but it didn’t become prevalent until the early to mid-2000s. Before that, we used Ethernet cables and before that, our primary method of connecting to the web was via phone lines. Every few years, our method of accessing the web changes to be faster and more accessible. Two things make me believe that the web will be accessible from anywhere and at any time: the rise of wireless 3G and 4G networks and the likelihood for nationwide Wi-Fi to blanket the U.S. and beyond. Let’s first talk about 3G: since its introduction in the early 2000s, it has quickly spread to major cities worldwide. Accessing the web is now as simple as pulling out your smartphone, and it’s getting faster with the introduction of 4G networks and 4G phones. The Apple Tablet is even rumored to have a data plan on Verizon and AT&T’s 3G networks. More and more laptops come with built-in 3G access as well. Nationwide Wi-Fi is the more exciting prospect, though. In 2008, the FCC had an auction for for the 700 MHz wireless spectrum. A lot of attention was focused on that auction when Google joined as a multi-billion dollar bidder. Some speculated that Google wanted to turn the spectrum into a nationwide Wi-Fi network. While Verizon eventually won, a nationwide Wi-Fi network is still very possible and, in fact, seems logical given the direction of web technology today. The point is that more devices will have access to these networks and that these networks will be more prevalent as time goes on. Ten to twenty years down the road, people will wonder how we managed with laptops disconnected from a Wi-Fi or 4G signal. In a column on CNN earlier this month, Mashable’s Adam Ostrow explored one of the biggest trends at CES:the embedding of the web outside of the computer . At present, we focus our Internet use in the U.S. on our laptops. In Japan though, many more access the web primarily through their phones, a trend that is just beginning to sweep the states. This is just the beginning. New Internet-enabled TVs will allow us to browse from the living room and soon our cars will become Wi-Fi hotspots. The Apple Tablet looks to be the next stage of this evolution. Rumor has it that not only is the device going to have 3G access, but Apple envisions it is a shared piece of hardware among the family. Instead of having to jump onto the computer to check your email, you can just have your girlfriend or boyfriend pass you the tablet to check out what’s going on. In ten years, computers will only be a small percentage of how we use our web. We’re going to be accessing it from nearly every device and appliance we own. The time of text-based interactions is going to diminish until they’re just a minor component of our web experience. Yes, we will always write, blog, and tweet, but as more and more devices adopt touchscreen interfaces and alternatives to the keyboard and mouse (it’s already happening), our reliance on videos from YouTube and Hulu, social games like FarmVille, and interactive interfaces like the iPhone OS will grow rapidly. – Voice-to-text technology will be a major part of the media-centric web. The technology isn’t accurate enough to use daily yet, but devices like the Nexus One are pushing its limits. In a decade or two, it’ll be accurate enough to be a viable replacement to our keyboards. – Interfaces that rely on motions are going to be more important to computing and the media-focused web. Apple popularized phone touchscreen interfaces, and the Tablet has a good shot and popularizing that type of interface on larger-sized screens. While we have a lot more to figure out before touchscreens are popularized on the desktop, I do think it’s time isn’t far away. I look forward to abandoning the old mouse and keyboard interface. – In the future, you won’t even have to touch the screen. HP’s “Wall of Touch” actually doesn’t require users to touch the screen in order to interact with it, and Microsoft’s Project Natal looks to turn gaming into a controller-less experience. This is the future. – These interfaces simply make it easier to bring up images, videos, music, and other multi-media. It’s not about keyboard commands, but about apps, drag-and-drop, and having an immersive experience. 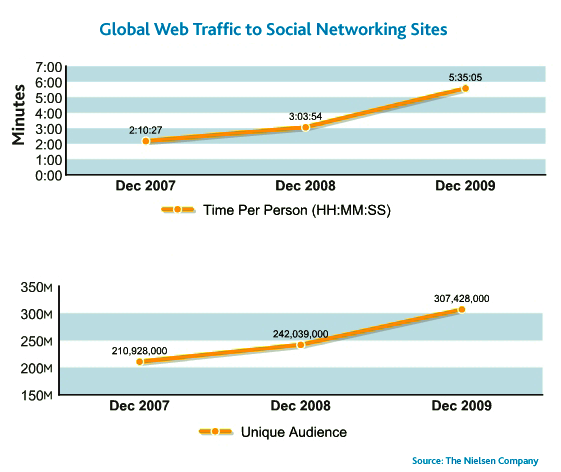 Stats published by Nielsen show that social media usage has increased by 82% in the last year, an astronomical rise. Facebook, Twitter, YouTube, blogs, and social interaction are becoming the focus of our online interactions, even more than search. We’re social creatures, so it was only a matter of time until we figured out how to make the web an efficient medium for communication, sharing, and forging friendships. Now that we’re finally implementing the social layer though, it’s tough to find a scenario where the rise of social media doesn’t continue. In ten years, when you access the web, most of the time you spend will be to connect with your friends. Almost all of that will be on social networks and through social media. It will be the #1 reason why we ever pull out our phones, tablets, or computers. We loved this MarketingProfs article by Laurel Sutton, a linguistics expert and a partner at Catchword. Like the internet phenoms they trumpeted, Internet company names of the last decade have been, by turns, wildly inventive, deeply troubled, breathtakingly silly, serviceable (if dull)—and, occasionally, brilliant. Having christened our share of Internet phenoms, we at Catchword decided to looked back to identify the 10 biggest dot-com naming trends—and their best and worst examples. Sometimes two words are better than one—especially to convey a new way of doing things. Serviceable hookups can range from descriptive (Facebook, StubHub) to suggestive (LinkedIn) to evocative (Snapfish). But if two words don’t have a discernible relationship with each other—or the brand—it’s a Random Hookup. And we all know how short-lived those are—in this or any realm. Intuitive, catchy, grassroots-y. The retro slang “tube” for TV evokes simpler times and ease of use: clever for a new app that could have been seen as intimidatingly high-tech. Evocative words can make memorable brand names when they relate to the core of a brand’s story (like Yelp). But the line can be fine between edgy and baffling. Whimsically conjures up users’ sharing short little bursts of information (like birds twittering in a tree)—as well as excitement (“all atwitter”). It’s extendable, too. A whole vocabulary quickly takes flight—from tweet and twitfriend to twipic. Great for cows, milk, cheese, ice cream. Not so great for a site offering printing services. The image of a camera’s flicker is relevant for photo sharing and reassuringly familiar, while the dropped letter—a new naming convention—suggested cutting-edge technology. Names assembled from word parts with meaningful associations can be rich and unexpected (witness Gizmodo, the gadget blog). But tone and messaging need to be just right. The unusualness of the name establishes it as a fresh player, while the evocation of both encyclopedias and speed (“wiki” is Hawaiian for “quick”) is spot on. This kind of brand name often spells disaster: hard to remember (Ideeli, Scrybe), confusing to pronounce and spell (Myngle, Wotnext, Gravee), and reeking of URL-search desperation (Itzbig, Profilactic, Fairtilizer). French word “beaucoup” is on the money for an online payment service—and for many Americans, the misspelling is actually more intuitive and inviting. Meant to be pronounced “cool,” but who’s gonna get that? Rule No. 1: Your name shouldn’t need to come with a pronunciation guide. Another convention that ages fast. And there’s nothing more pathetic in naming than a transparent attempt to appear cool (cases in point: Dogster, Agester, Talkster). Not exciting, we’ll grant you, but the intuitiveness of the name helped usher in the era of social networking. In light of its ensuing legal woes, to highlight the “kidnapping” of music is probably not the best idea (to put it kindly). Doubling a letter in a real word only works when the word remains recognizable, and the addition of the second letter serves some purpose, other than to complicate spelling (as in Gawwk). Intuitive and evocative, the double “g” underscores the digging nature of research and is graphically interesting. A social bookmarking site, the double “i” destroys the semantic connection and confuses pronunciation. (Is it Dee-go or Dih-go?) Plus, coming on the heels of Digg, it seems hopelessly derivative. A word without recognizable semantic roots can be a useful umbrella name for a company that may want to branch out in different directions. But it needs to be pronounceable and have relevant sound symbolism. Otherwise, it’s not an Empty Vessel—it’s Alphabet Soup. Like Disaboom, Xoopit, Yebol, and Goozex. Cover your ears. Vintage Web 2.0: hard to spell, silly—and utterly meaningless. Words in little-known languages can also make good empty-vessel names, especially if their meaning provides a springboard into their brand story. The trick is to find words that are easy to pronounce and pleasing to the American ear (like Kijiji, a communal website with a Swahili name meaning “village”). Good empty vessel name for an entertainment company that wants to keep its options open. (Interestingly, the word means “empty gourd” in Mandarin.) The rhyming word is playful, and by evoking hula hoops, it suggests fun. As for Internet company naming trends of the coming decade: Companies will demand more meaningful brand names, as far from Web 2.0 flights of fancy as possible; they’ll be willing to pay a premium for real-word or lightly coined domain names; and they will be creative in the messages they explore—as long as they’re relevant to the brand. Like Internet companies themselves, it appears, Internet naming will be coming back down to earth. Looks like the sleeping online video giant that is Facebook may finally have awoken. According to Nielsen’s latest VideoCensus numbers, Facebook jumped to No. 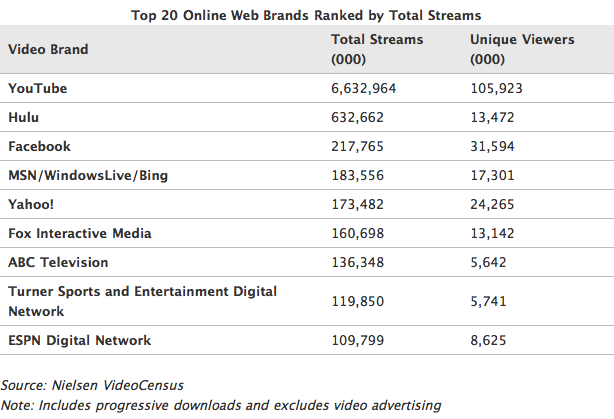 3 behind established video powerhouses YouTube and Hulu in terms of total streams. That’s up from No. 10 just last month. Facebook generated more than 217 million streams in October to more than 31.5 million unique viewers, up from 110 million streams to 23 million viewers in September.